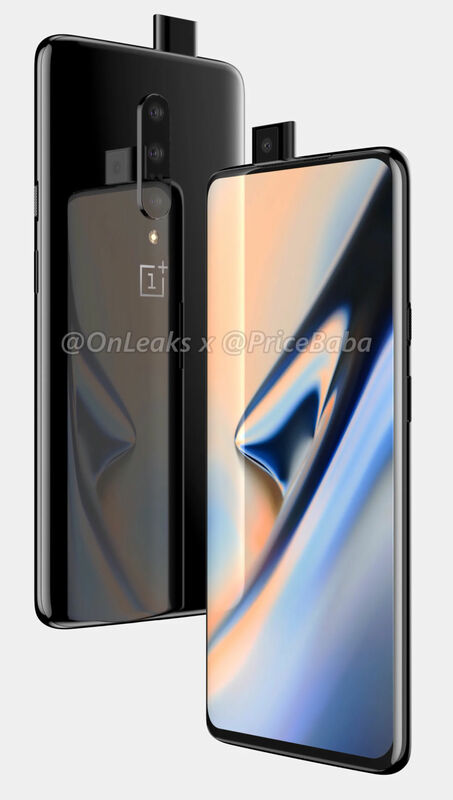 We purportedly have our first good look at the next OnePlus device, which will probably be called the OnePlus 7, thanks to a set of device renders created by OnLeaks (hosted over at Pricebaba). OnLeaks has a great track record with these first-look renders, having most recently nailed the Galaxy S10 and Pixel 3, so this is worth looking at, too. So far in 2019, most manufacturers are moving beyond the notch display cutout for front camera placement (well, unless you are LG). On most new devices, we would expect something like the Galaxy S10's "hole punch" display, but OnePlus appears to be throwing us a real curveball and putting a pop-up front camera in a mainstream device. On the top of the phone, a square block pops up when it's time to take a picture, leaving no blemishes on the front display at all. The leak puts the display at 6.5 inches, which would be a small increase from the 6.41-inch display on the OnePlus 6T. OnePlus' parent company, BBK, has been experimenting with moving cameras for the last year or so, having also released the Oppo Find X and Vivo Nex. Like in the Vivo Nex, the new camera is presumably motorized and will open when you switch to the front camera in the camera app.